Democrat Bill Frick, then a state delegate, defends a bill increasing the state's use of renewable energy to 25 percent by 2020 during a press conference last year. Hogan vetoed that bill, but he hasn't said whether he will back a new effort to increase the state's use of renewable energy to 50 percent by 2030. “If we don’t do it, other states are going to come in and capture these jobs,” said Sen. Brian Feldman, a Montgomery County Democrat and the bill’s lead sponsor in his chamber. He cited an analysis that estimates the measure will create about 25,000 jobs in solar and wind energy. This is the second year the bill has been considered in Annapolis, but Mike Tidwell, director of the Chesapeake Climate Action Network, told reporters on a conference call Thursday that he and other backers are optimistic. “A super majority of members of the Maryland House of Delegates and a super majority of senators have declared their support already,” he said. That would be enough votes to override a potential veto by Gov. Larry Hogan, a Republican. Hogan has not said whether he supports the measure. A spokeswoman for Hogan said he will evaluate this legislation, like all legislation, if and when it reaches his desk. In 2016, Hogan vetoed a bill increasing the state’s use of renewable energy to 25 percent by 2020, and the legislature overrode that veto. But Feldman said this time might be different. “Particularly now in light of all the work, all the research coming out of the federal government in the past couple of weeks about the need to move away from fossil fuels and climate change and the end of the world, … there's an urgency this year that I think wasn't the case last year,” he said. 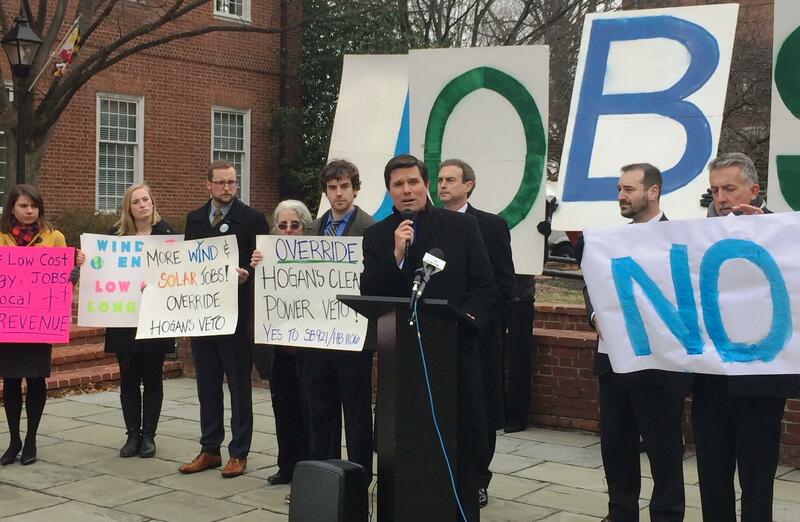 He also highlighted an op-ed in The Washington Post this week that Hogan co-wrote with Virginia Gov. Ralph Northam, a Democrat. It touts a Maryland law requiring a 40-percent reduction in greenhouse gas emissions by the year 2030. A recent study commissioned by the Maryland Department of the Environment shows that one way to achieve that is by committing to 50-percent renewable energy in that timeframe.